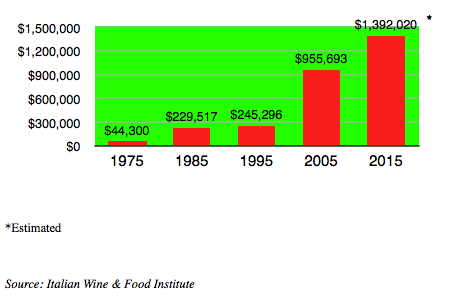 The expansion of wine consumption in the U.S. started in the mid-1970s and has been steadily rising ever since. 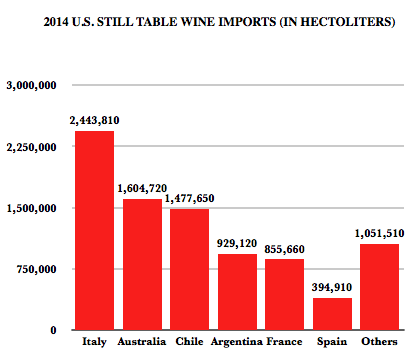 During that period, the U.S. imported wine market was dominated by French wine, generally considered then to be by far the best available. Italian wine followed at a considerable distance in second place, and were considered of only modest quality. 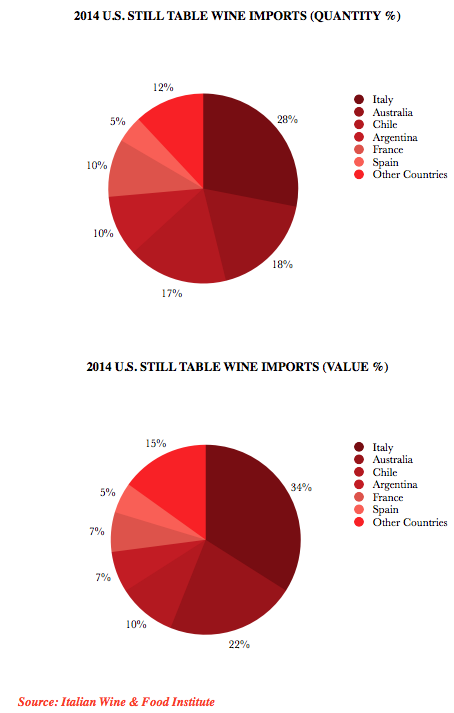 Australian and South American wines were nonexistent. This was the situation at the start of Italian wine’s success story. For the past forty years, Italian wine moved from an unknown, irrelevant stance in the market to its current leadership position. Instrumental in this success was the promotional campaign originated and conducted from 1975 to 1982 by Dr. Lucio Caputo, the then Italian Trade Commissioner in New York who launched Italian wines in the U.S. market. Despite third-party disbelief and opposition, this unprecedented, famous and uniquely coordinated seven-year-long campaign resulted in the great success of Italian wine, as it reached many potential consumers in every corner of the U.S. and attracted them to Italian wine. Part of this campaign was the beautiful Enoteca that was built in the new Italian Trade Center on Park Avenue. 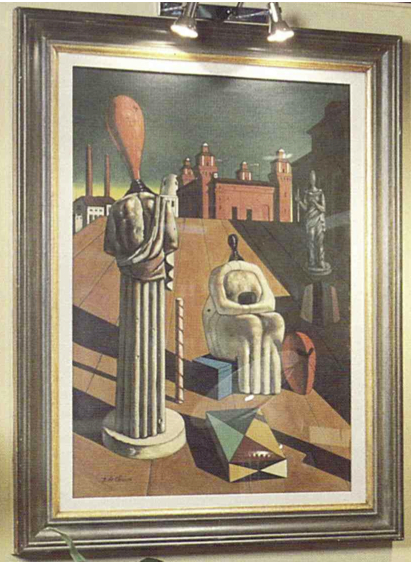 Standing prominently within the Enoteca was one of the most famous paintings by Giorgio De Chirico, “Le Muse Inquietanti,” which was donated by several Italian wine producers in appreciation for the astonishing results of the promotional campaign. 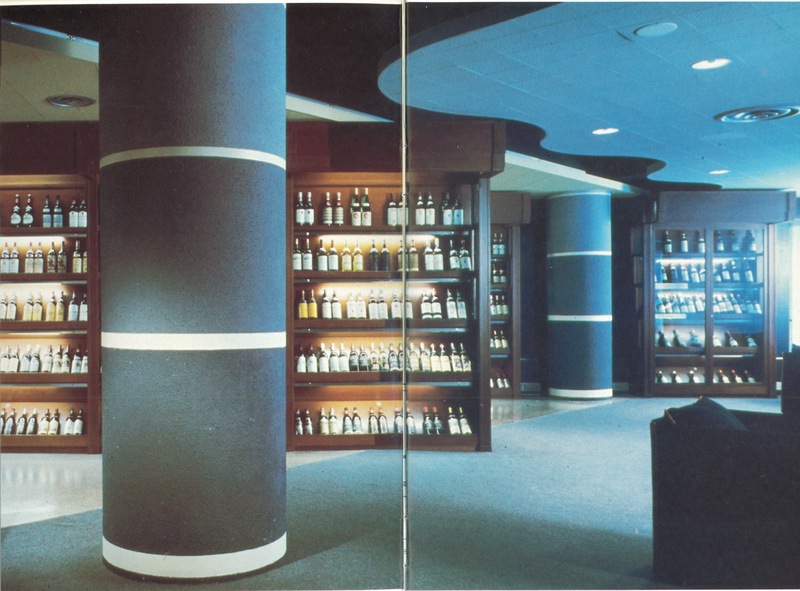 The campaign’s success was immediate: imports of Italian wines jumped from approximately 360 thousand hectoliters in 1974 to over 2.2 million hectoliters in 1985 with an increase of 511%, and from $37 million in 1974 to $230 million in 1985, with an incredible increase of 522%. This success was even more extraordinary if compared with the more modest increase, in the period 1975-1985, of 192% in quantity and 254% in value experienced by total wine imports, and with the 272% increase in quantity and 362% in value of French wine imports. After Lucio Caputo left the Italian Trade Commission in 1982 to become President of Italtrade, the promotional campaign in favor of Italian wines was abruptly stopped, the Enoteca was dismantled and all the available government funding was given to other sectors, under the assumption that the wine industry did not need any further public support. Under strong pressure from top Italian wine producers and with the support of Pino Khail, editor of the leading wine magazine Civiltà del bere, Caputo founded the Italian Wine & Food Institute in 1983, a non-profit organization specially created to continue promoting high-quality Italian wine in the U.S.
GALA ITALIA was one of the first successful events designed to specifically promote the most prestigious Italian wine in the U.S., in spite of limited funding. By focusing primarily on promoting the top, highest-quality Italian wines, GALA ITALIA stands out among other events organized in the U.S. For the past thirty years, the Italian Wine & Food Institute has been concentrating on promoting the most established Italian wines to improve their image and status symbol. After a period of contractions from 1986 to 1993, the U.S. wine market regained its strength and Italian wines once again led the way. 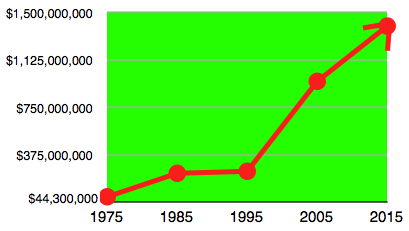 In the process, the varieties and the qualities of Italian wines changed dramatically and from the very inexpensive, simple wines of the 1970s and 1980s (which, however, encouraged consumers to abandon their carbonated drinks for wine), the Italian wine imports moved to the high quality of the most prestigious Italian production. 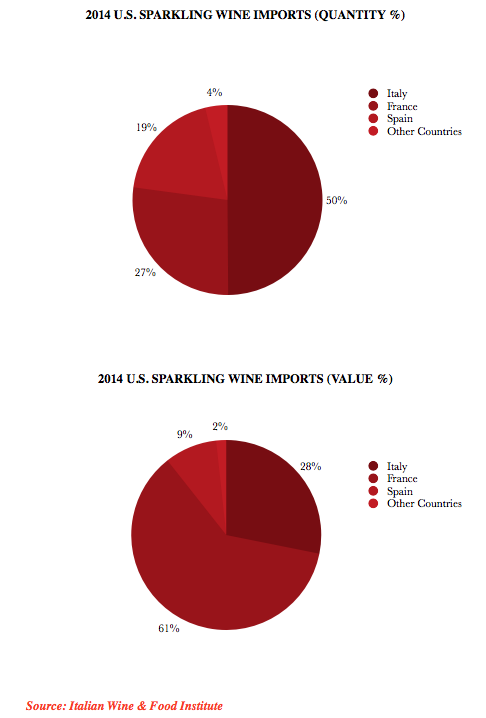 As more sophisticated American consumers began to appreciate these fine wines, the proportion between quantity and value of Italian imports attained a better balance. 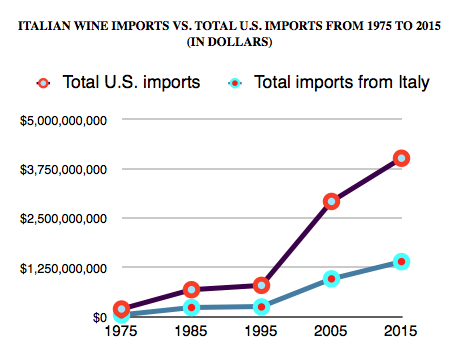 In 1995, the total import of Italian wines reached $245.2 million with an increase of 565%. 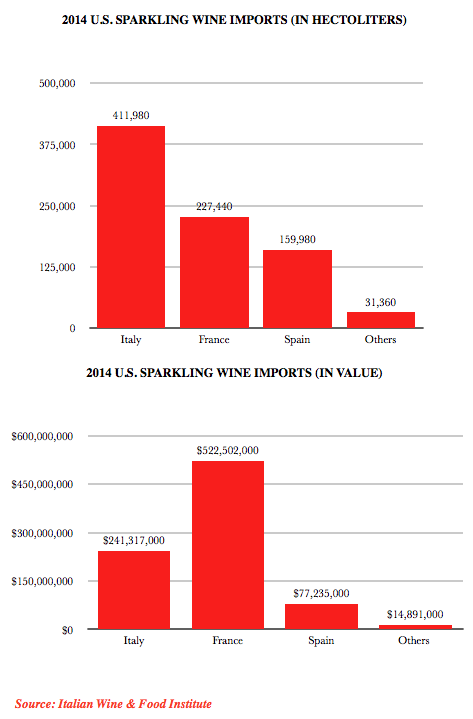 In 2001, Italy surpassed France, which was then dominating the American market, in both quantity and value. 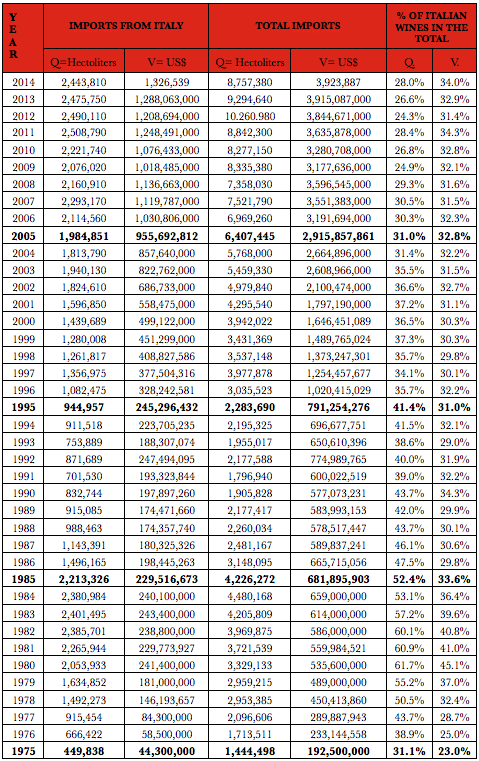 In 2005, Italian imports climbed to $955.6 million with an increase of 2,490%. In 2006, for the first time in history, Italian imports in the U.S. passed the $1 billion mark, with over two million hectoliters of Italian wines imported. In 2014, the import of Italian wines passed $1.3 billion with an astounding increase of over 3,520%, and is expected to pass the $1.4 billion mark by the end of this year and $1.7 billion with the inclusion of sparkling wines. In the past forty years, Italian wine has become an unmatched success story that is still in progress. 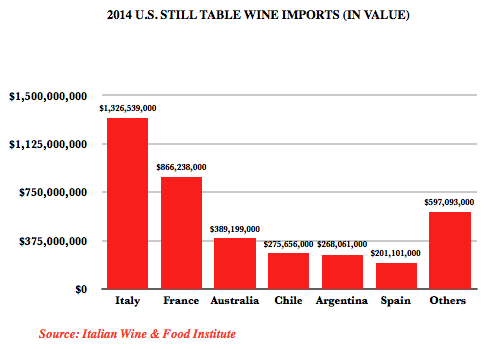 Today, Italy dominates the U.S. wine market not only in quantity and in value, but also in the number, selection, variety and quality of the wine offered with the best combination of price and quality. The 30th anniversary of GALA ITALIA—the event that has promoted over the years the finest and most prestigious Italian wines—is therefore the perfect occasion to celebrate the success of Italian wine and the producers behind this success, and to thank both the American media that spread the message, and the millions of consumers who are now fully enjoying Italian wine. 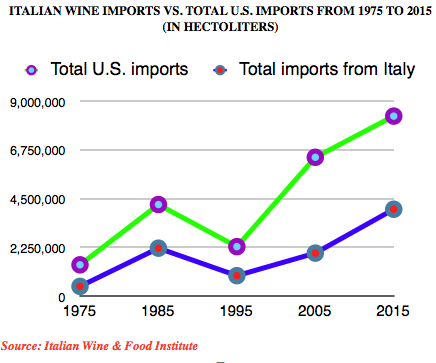 Following several charts detailing the success story of the Italian wines in the U.S.